The Army Heritage and Education Center (AHEC) was a means of further improving the Army’s educational capabilities by more fully communicating the holdings of the Institute to the U.S. Army and the American People. The first building constructed on the newly established AHEC campus was Ridgway Hall in 2001. The new Ridgway Hall boasts the highest standards for storage of archival holdings to include strict environmental controls and security features. It also provides for greater service to patrons with a spacious, accessible reading room and six large areas for housing the collection. 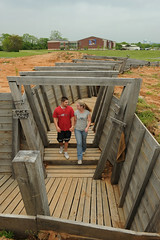 Originally intended to be the final phase of the AHEC project, the Army Heritage Trail is currently the AHEC’s most recognized and visible component. From Interstate 81 passers-by may view a German M-88 Tank Destroyer angled on a Sherman Tank at the Omaha Beach exhibit; 18th Century cannons poking out from the Yorktown Redoubt; or smoke puffing from the chimney of the French and Indian War waystation. 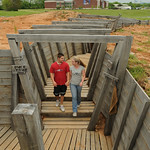 Presented as an interactive outdoor museum, the Army Heritage Trail graphically depicts the major campaigns in which the U.S. Army participated since its inception. The AHEC has plans for three additional buildings on campus to enhance the visitor experience and further the AHEC’s ability to collect and preserve Soldier stories. The AHEC will cease weekend operations for the winter beginning November 1, 2008. We will resume weekend operations on April 4, 2009.